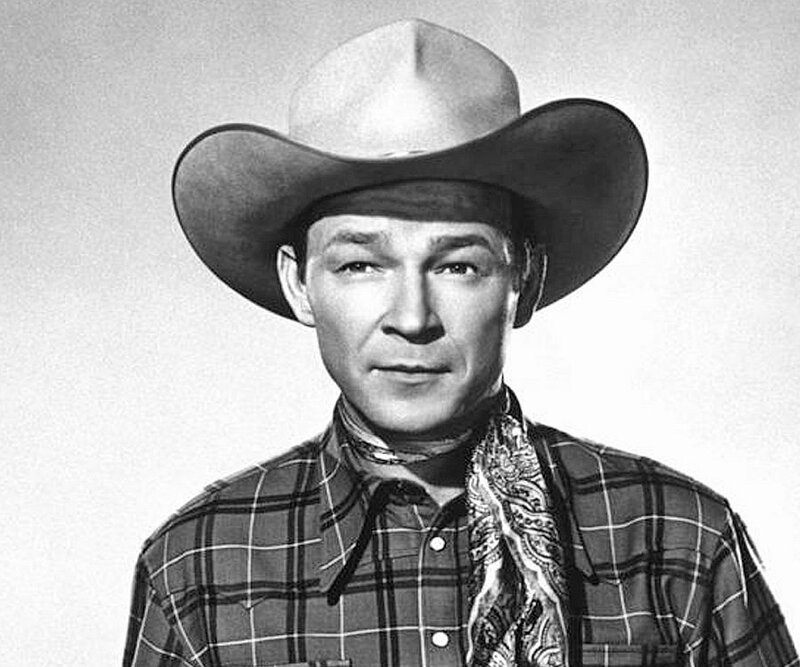 Today is the birthday (1911) of Leonard Franklin Slye, better known by his stage name — Roy Rogers. He was a U.S. singer and cowboy actor who was one of the most popular Western stars of his era. I was certainly a fan as a boy. He was known as the “King of the Cowboys” and appeared in over 100 films and numerous radio and television episodes of The Roy Rogers Show. In many of his films and television episodes, he appeared with his wife Dale Evans, his golden palomino Trigger, and his German Shepherd dog Bullet. His show ran on radio for nine years before moving to television from 1951 through 1957. His productions usually featured a sidekick, often Pat Brady, Andy Devine, or George “Gabby” Hayes. Leonard Slye typifies for me the U.S. cowboy singer/actor. That is, he was not born in the West, nor worked as a real cowboy. The cowboy of movies and television bears little resemblance to real cowboys of the Old West. Slye was born to Mattie (née Womack) and Andrew “Andy” Slye in Cincinnati, Ohio. The family lived in a tenement building on 2nd Street, where Riverfront Stadium would later be constructed (he would later joke that he was born at second base). Dissatisfied with his job and city life, Andy and his brother Will built a 12-by-50-foot (3.7 m × 15.2 m) houseboat from salvage lumber, and in July 1912 the Slye family traveled up the Ohio River towards Portsmouth, Ohio. Desiring a more stable existence in Portsmouth, they purchased land on which to build a house, but the Great Flood of 1913 allowed them to move the houseboat to their property and continue living in it on dry land. 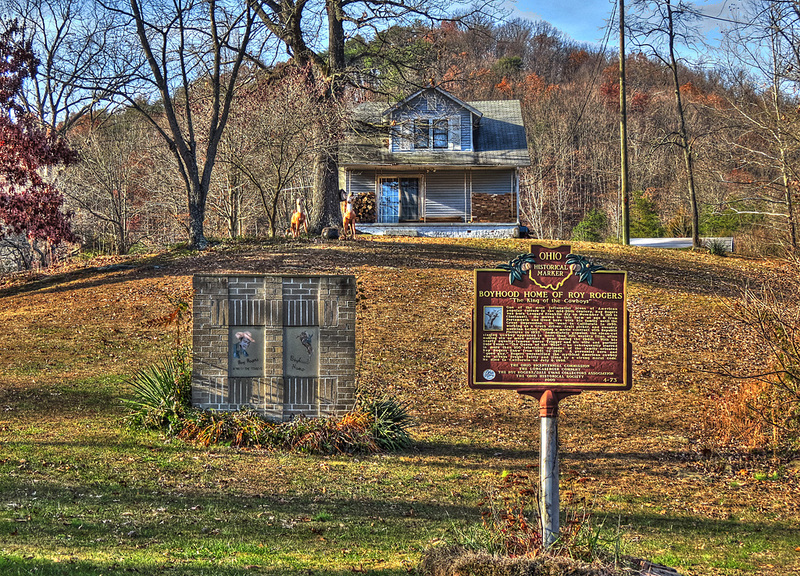 In 1919 the Slye family purchased a farm in Duck Run, near Lucasville, Ohio, about 12 miles (19 km) north of Portsmouth, and built a six-room house. Andy Slye soon realized that the farm alone would provide insufficient income for his family, so he took a job at a Portsmouth shoe factory, living in Portsmouth during the week and returning home on weekends bearing gifts following paydays. A notable gift was a horse on which young Len Slye learned the basics of horsemanship. Living on the farm with no radio, the family made their own entertainment. On Saturday nights, the family often invited neighbors over for square dances, during which Len would sing, play mandolin, and call the square dances. He also learned to yodel during this time. After completing the eighth grade, Len attended high school in McDermott, Ohio. After his second year in high school, his family returned to Cincinnati, where his father began work at another shoe factory. Realizing that his family needed his financial help, Len quit school and joined his father at the shoe factory. He tried to attend night school, but after repeatedly falling asleep in class, he quit and never returned. By 1929, after Len’s older sister Mary and her husband moved to Lawndale, California, he and his father quit their factory jobs, packed up their 1923 Dodge, and drove the family to California to visit Mary. They stayed for four months before returning to Ohio. Soon after returning, young Len had the opportunity to travel again to California with Mary’s father-in-law, and the rest of the family followed in the spring of 1930. The Slye family rented a small house near Mary, and Len and his father found work driving gravel trucks for a highway-construction project. In the spring of 1931, after the construction company went bankrupt, Len traveled to Tulare, California where he found work picking peaches for Del Monte. During this time he lived in a labor camp similar to the ones depicted in John Steinbeck’s The Grapes Of Wrath. After 19 year old Len Slye’s second arrival in Lawndale, his sister Mary suggested that he audition for the Midnight Frolic radio program, which broadcast over KMCS in Inglewood. A few nights later, wearing a Western shirt that Mary had made for him, Leonard overcame his shyness and appeared on the program playing guitar, singing, and yodeling. A few days later, he was asked to join a local country music group called The Rocky Mountaineers. Len accepted the group’s offer and became a member in August 1931. By September 1931, Slye hired Canadian-born Bob Nolan who answered the group’s classified ad in the Los Angeles Herald-Examiner that read, “Yodeler for old-time act, to travel. Tenor preferred.” Although Nolan stayed with the group only a short time, he and Len stayed in touch. Nolan was replaced by Tim Spencer. 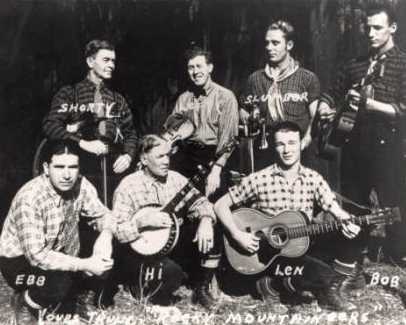 In the spring of 1932, Len Slye, Spencer, and another singer, Slumber Nichols, left the Rocky Mountaineers to form a trio, which soon failed. Throughout that year, Len and Tim Spencer moved through a series of short-lived groups, including the International Cowboys and the O-Bar-O Cowboys. 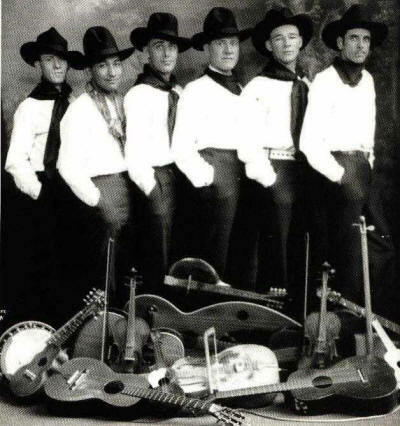 When Spencer left the O-Bar-O Cowboys to take a break from music, Len joined Jack LeFevre and His Texas Outlaws, who were a popular act on a local Los Angeles radio station. In early 1933, Len Slye, with Bob Nolan, and Tim Spencer formed a group called the Pioneers Trio, with Slye on guitar, Nolan on string bass, and Spencer on lead vocals. The three rehearsed for weeks refining their vocal harmonies. During this time, Slye continued to work with his radio singing group, while Spencer and Nolan began writing songs for the trio. In early 1934, fiddle player Hugh Farr joined the group, adding a bass voice to the group’s vocal arrangements. Later that year, the Pioneers Trio became the Sons of the Pioneers when a radio station announcer changed their name because he felt they were too young to be “pioneers”. The name was received well and fit the group, who were no longer a trio. By the summer of 1934, the popularity and fame of the Sons of the Pioneers extended beyond the Los Angeles area and quickly spread across the country through short syndicated radio segments that were later rebroadcast across the United States. After signing a recording contract with the newly founded Decca label, the Sons of the Pioneers made their first commercial recording on August 8, 1934. One of the first songs recorded by the group during that first August session was “Tumbling Tumbleweeds” written by Bob Nolan. Over the next two years the Sons of the Pioneers would record 32 songs for Decca, including the classic “Cool Water”. From his first film appearance in 1935, he worked steadily in Western films, including a large supporting role as a singing cowboy while still billed as “Leonard Slye” in a Gene Autry movie. In 1938, when Autry was demanding more money for his work, Slye was immediately rechristened “Roy Rogers.” Actually, there was a competition for a new singing cowboy, and many western singers sought the job, including Willie Phelps of the Phelps brothers who appeared in early western movies. Slye ended up winning the contest and became Roy Rogers. 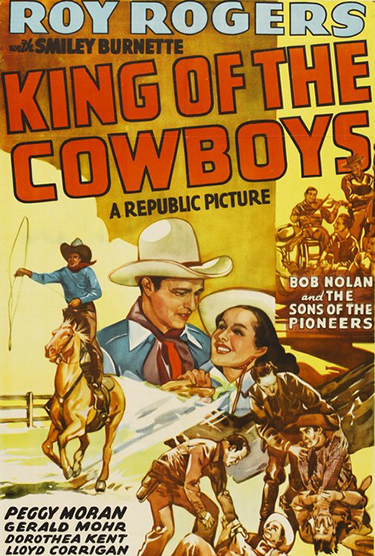 Slye’s stage name was suggested by Republic Picture’s staff after Will Rogers and the shortening of Leroy, and he was assigned the lead in Under Western Stars. Rogers became a matinee idol and U.S. cowboy legend. A competitor for Gene Autry as the nation’s favorite singing cowboy was suddenly born. In addition to his own movies, Rogers played a supporting role in the John Wayne classic Dark Command (1940). Rogers became a major box office attraction. Unlike other stars, the vast majority of Rogers’ leading roles allowed him to play a character with his own name in the manner of Gene Autry. The Sons of the Pioneers continued their popularity, and they have never stopped performing from the time Rogers started the group, replacing members as they retired or died (all original members are deceased). Although Rogers was no longer an active member, they often appeared as Rogers’ backup group in films, radio, and television, and Rogers would occasionally appear with them in performances up until his death. When Rogers died of congestive heart failure on July 6, 1998, he was living in Apple Valley, California. He was buried at Sunset Hills Memorial Park in Apple Valley, as was his wife, Dale Evans, three years later. The Roy Rogers is a very simple non-alcoholic drink which I won’t spend too much time on. You’ll need a bottle of Coca-Cola, some grenadine syrup, maraschino cherries, and a glass of ice. 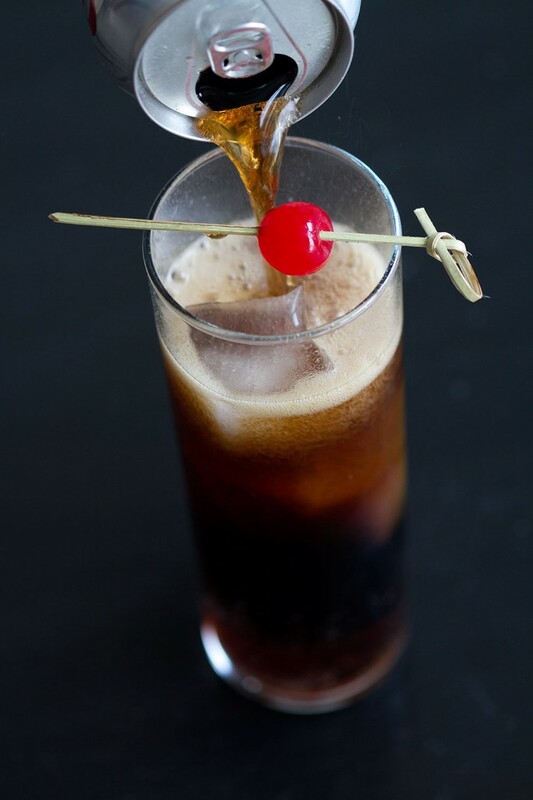 Add a dash of grenadine to the ice, pour in the Coke, and garnish with a cherry. Done. Let’s get a little more serious about cowboy cooking. I’ll state point blank, as an historian, that I don’t think there is any such thing as authentic cowboy cooking. It’s as much of a romantic fiction as Roy Rogers is. Sure, cattle drives needed a chuck wagon and a cook. But, did these cooks have special recipes and recipe books that they followed once they were out on the trail? Spare me. What we should remember is that in the 19th century cattle drives had most of the limitations of sea-going vessels when it comes to the basics of the larder, but they did have live meat on the hoof. Chuck wagons would have carried the obvious staples such as dried legumes, rice, and flour which would form the basis for stews and breads. Perishables such as fresh vegetables and eggs would have been in short supply. If an animal died on the drive it would have been eaten – pure and simple. The slow and sick would also have been disposed of in short order. More to the point for me is the nature of the cooking equipment. 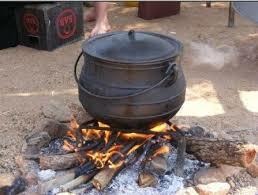 When you look at old photos of cattle drive makeshift kitchens you see a lot of cast iron pots – skillets and ovens. Cast iron is eminently practical on a cattle drive because it is durable. For over 30 years I had two cast iron skillets which I used just about every day. One I had inherited from my wife’s grandmother, and one I bought new. After 30 years I couldn’t tell the difference. New cast iron pans have to be seasoned so that they do not rust. This is really only the start of a very long process. They take years to season properly. As it is, there is a great deal of false information doing the rounds about cast iron skillets. For a start, well-seasoned skillets are NOT non-stick. Preheated properly, and lightly coated with oil, they will resist sticking. But take it from me – they stick. They are not Teflon. Second, they do not heat evenly. They do, however, retain heat very well. Third, you do not have to worry about cooking acidic sauces in them. The seasoning remains just fine. In fact acidic sauces combine with a tiny bit of the iron to provide you with extra dietary iron. Fourth, you can clean a cast iron skillet with soap and water just as you do any other cooking pot. Seasoning is not complicated. The simplest way is to clean the skillet thoroughly with soapy water and a stiff brush. This removes any oil that it was coated with to prevent rust. Dry the skillet thoroughly and then wipe it with fat or oil so that it is completely covered. Place it upside down on the middle rack of an oven heated to 350°F with a pan under it to catch drips. Let it bake for at least an hour, then turn the oven off and let the skillet cook down in the oven. It is now minimally seasoned. Cooking with it for 10 years will finish the job. If you see an old skillet in a yard sale going cheap, snag it. 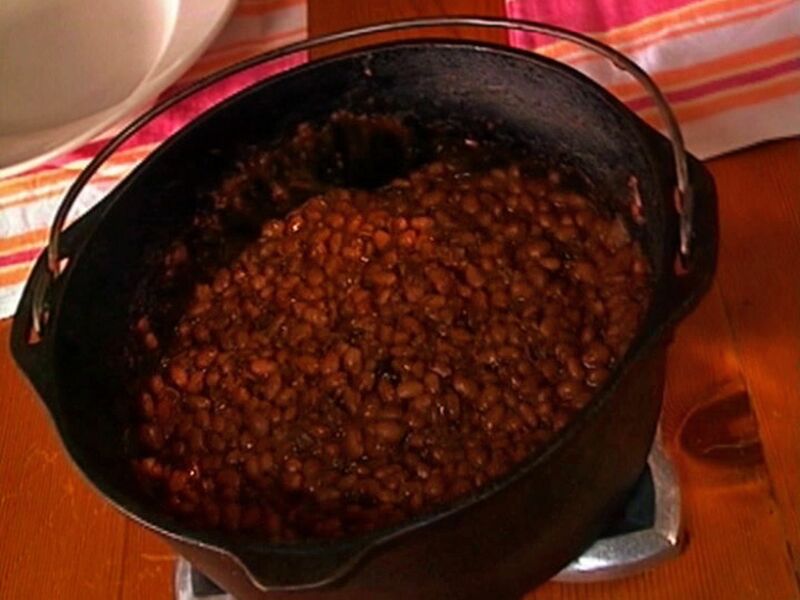 I’d say that the simplest “cowboy” recipe is beef and beans, and would have been very common on the trail. No need for a detailed recipe. Soak a pot of dried beans overnight. In the morning drain them and add fresh water to cover. Also add stewing beef (preferably on the bone) and simmer for at least 2 hours. You can add whatever spices come to mind. I’m sure trail cooks had their favorites. Hot paprika is enough for me, but I like cumin as well. The main trick is to simmer very slowly for long hours so that the meat is falling from the bone. The starch from the beans will thicken the sauce as it reduces. This is as about as simple as it gets and I am sure is very close to what cowboys ate a lot of the time. 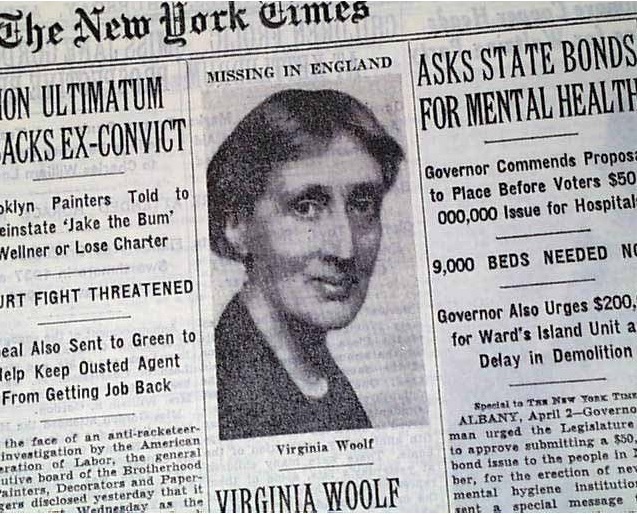 Woolf was educated by her parents in their literate and well-connected household. Her parents had each been married previously and been widowed, and, consequently, the household contained the children of three marriages. Her mother, Julia, had three children by her first husband, Herbert Duckworth: George, Stella, and Gerald Duckworth. Her father, Leslie Stephen, had first married Harriet Marian (Minny) Thackeray (1840–1875), the daughter of William Thackeray, and they had one daughter: Laura Makepeace Stephen, who was declared mentally disabled and lived with the family until she was institutionalized in 1891. Leslie and Julia had four children together: Vanessa (later known as Vanessa Bell) (1879), Thoby (1880), Virginia (1882), and Adrian (1883). Leslie Stephen’s eminence as an editor, critic, and biographer, and his connection to William Thackeray, meant that his children were raised in an environment filled with the influences of Victorian literary society. Henry James, George Henry Lewes, and Virginia’s honorary godfather, James Russell Lowell, were among the visitors to the house. Julia Stephen was equally well connected. She came from a family of beauties who left their mark on Victorian society as models for Pre-Raphaelite artists and early photographers, including her aunt Julia Margaret Cameron who was also a visitor to the Stephen household. Supplementing these influences was the immense library at the Stephens’ house, from which Virginia and Vanessa were taught the classics and English literature. Unlike the girls, their brothers Adrian and Julian (Thoby) were formally educated and sent to Cambridge, a difference that Virginia would resent. The sisters did, however, benefit indirectly from their brothers’ Cambridge contacts, as the boys often brought their new intellectual friends home. According to Woolf’s memoirs, her most vivid childhood memories were not of London but of St Ives, Cornwall, where the family spent every summer until 1895. The Stephens’ summer home, Talland House, looked out over Porthminster Bay, and is still standing, though somewhat altered. Memories of these family holidays and impressions of the landscape, especially the Godrevy Lighthouse, informed the fiction Woolf wrote in later years, most notably To the Lighthouse. The sudden death of her mother in 1895, when Virginia was 13, and that of her half-sister Stella two years later, led to the first of Virginia’s several nervous breakdowns. She was, however, able to take courses of study (some at degree level) in Ancient Greek, Latin, German and history at the Ladies’ Department of King’s College London between 1897 and 1901. This brought her into contact with some of the early reformers of women’s higher education such as the principal of the Ladies’ Department, Lilian Faithfull (one of the so-called Steamboat ladies), Clara Pater (sister of the more famous Walter, George Warr. Her sister Vanessa also studied Latin, Italian, art and architecture at King’s Ladies’ Department. The death of her father in 1904 provoked a serious mental crisis and she was briefly institutionalized. 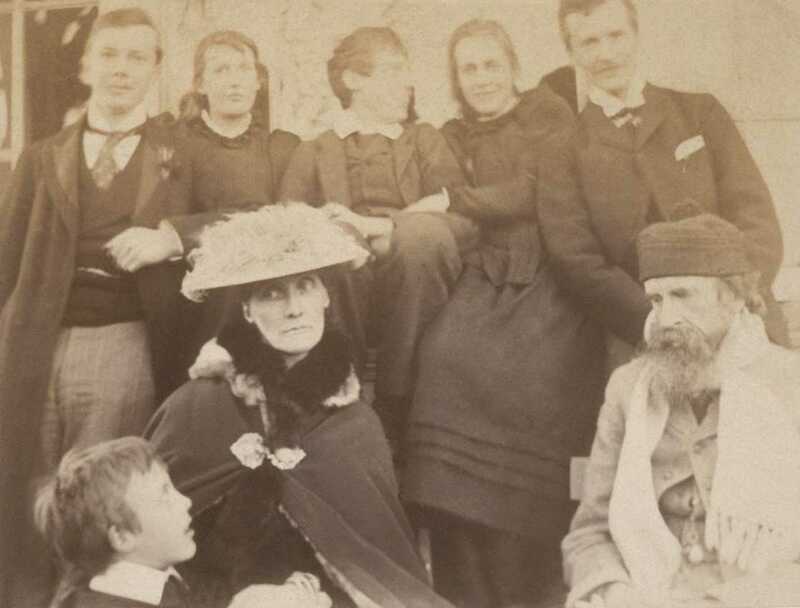 Modern scholars (including her nephew and biographer, Quentin Bell) have suggested her breakdowns and subsequent recurring depressive periods were influenced by the sexual abuse to which she and her sister Vanessa were subjected by their half-brothers George and Gerald Duckworth (which Woolf recalls in her autobiographical essays A Sketch of the Past and 22 Hyde Park Gate). Throughout her life, Woolf was plagued by periodic mood swings and associated illnesses. She spent three short periods in 1910, 1912 and 1913 at Burley House, 15 Cambridge Park, Twickenham, described as “a private nursing home for women with nervous disorder.” Though this instability often affected her social life, her literary productivity continued with few breaks throughout her life. After the death of their father and Virginia’s second nervous breakdown, Vanessa and Adrian sold 22 Hyde Park Gate and bought a house at 46 Gordon Square in Bloomsbury. 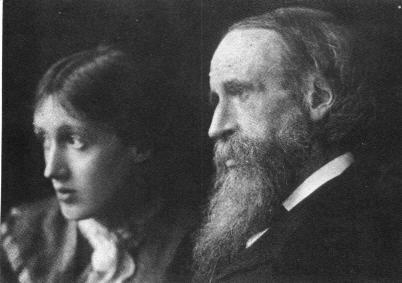 Woolf came to know Lytton Strachey, Clive Bell, Rupert Brooke, Saxon Sydney-Turner, Duncan Grant, Leonard Woolf, John Maynard Keynes, David Garnett, and Roger Fry, who together formed the nucleus of the intellectual circle of writers and artists known as the Bloomsbury Group. 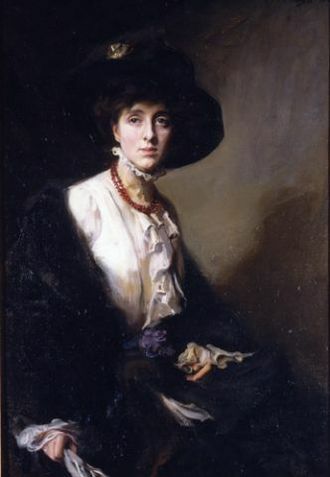 In 1907 Vanessa married Clive Bell, and the couple’s interest in modern art had an important influence on Woolf’s development as an author. First he is a Jew; second he is 31; third, he spent 7 years in Ceylon, governing natives, inventing ploughs, shooting tigers, and did so well that they offered him a very high place, which he refused, wishing to marry me, and gave up his entire career there on the chance that I would agree. He has no money of his own… but from the first I have found him the one person to talk to. We analyse each other’s idiosyncrasies in the light of psycho-analysis walking round the square. My reports, however, are apt to twist up into balls what is really amicable, serious, disinterested, and almost wholly affectionate. It’s true that Leonard sees my faults. The two also collaborated professionally, in 1917 founding the Hogarth Press, which subsequently published Virginia’s novels along with works by T. S. Eliot, Laurens van der Post, and translations of Freud’s works. The Press also commissioned works by contemporary artists, including Dora Carrington and Vanessa Bell. Woolf began writing professionally in 1900, initially for the Times Literary Supplement with a journalistic piece about Haworth, home of the Brontë family. 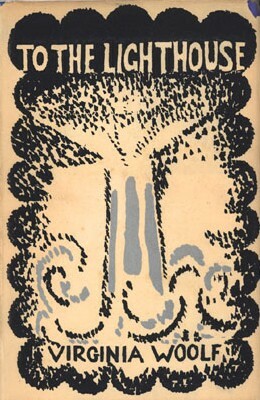 Her first novel, The Voyage Out, was published in 1915 by her half-brother’s imprint, Gerald Duckworth and Company Ltd. Woolf went on to publish novels and essays to both critical and popular success. Much of her work was self-published through the Hogarth Press, because she struggled dealing with external criticism and rejection. Woolf is considered a major innovator in the English language. In her works she experimented with stream of consciousness and the underlying psychological as well as emotional motives of characters. 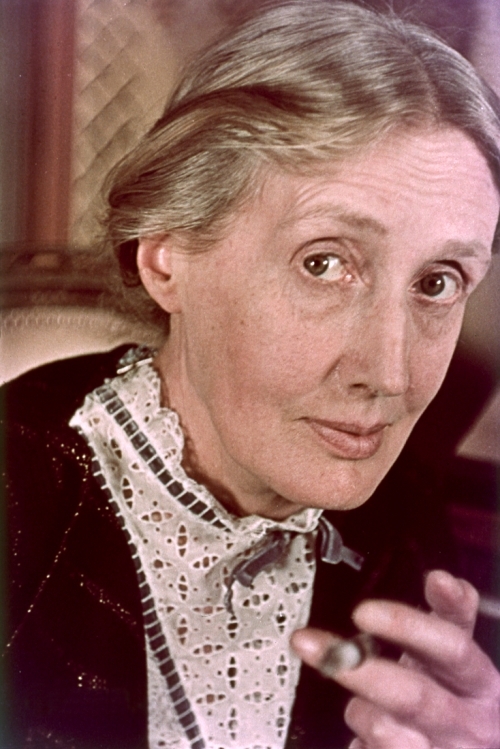 Woolf’s reputation declined sharply after World War II, but her importance was re-established with the growth of feminist criticism in the 1970s. I taught Woolf for about 10 years as part of a general course for freshmen. To The Lighthouse was required reading for all first year students in the spring semester. I never felt I could do much with the text for a whole host of reasons. The Freudian/Oedipal theme between James and Mr Ramsay that runs through the entire novel seems heavy handed nowadays, although when the book was first published I expect it was novel and engaging. I do grasp the idea that by using a stream-of-consciousness writing style Woolf was trying to paint a picture of what a day in the life of the Ramsays and entourage in their summer house was like, and I find it well enough done for what it is. Obviously the whole scene is heavily autobiographical; Woolf could well be describing a summer in St Ives with her family and their glitterati friends in the 1920s. The reason I find it well enough done is that I find the writing about the events as tiresome as I would have found the events themselves. Sitting around day after day reading or discussing “good” literature with a bunch of rich and “important” people, would drive me up the wall. These sentiments are soul searing. Trying to convey their meaning to 18 year olds in New York in the 1980s was impossible. The final chapters of the first part of To the Lighthouse describe a formal dinner party which Mrs Ramsay hosts. The soup course is of particular concern for many reasons. The full text of the book is here if you want to delve the mysteries of Mrs Ramsay and her ladling of the soup: http://gutenberg.net.au/ebooks01/0100101.txt There is no mention of what kind of soup it is, nor any other details about the meal, only that the soup was worth seconds for one guest – and that caused a stir. 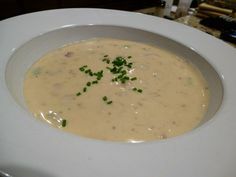 So here’s a soup that was popular at the time, Royal Cheddar Cheese Soup. Melt the butter over medium heat in a heavy pan. Add the onions, potatoes, and garlic and sauté 10 minutes. Add the chicken stock and bring to a gentle simmer. Cook for 20 minutes. Using a food processor or blender purée the stock and vegetables . Whisk together the dry mustard and heavy cream in the pan over medium heat. Then add back the purée and heat through, stirring to avoid sticking. Stir in the cheese and hot sauce and keep stirring until the cheese has melted. Ladle into serving bowls and garnish with some chives.